In case you were wondering what happened to the long-aborning movie about Vegas showman Liberace and his young lover, here’s the latest. Matt Damon, who plays the lover (Matt’s gotten a little pudgy, helping his baby-facedness, but he’s no longer young), says that the movie is planned for next summer. 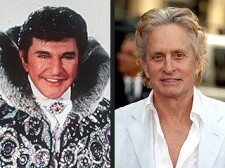 Michael Douglas (right) is to play the Liberace, assuming he (Douglas, Liberace is long dead) has recovered sufficiently from cancer. Liberace Movie To Become Musical?